There are many reasons to visit a national park, from spending time with family to supporting preservation and communing with nature. Plus, a trip to a natural park helps you to de-stress and calms your mind. You can travel to a national park with friends and family to improve your social well-being and strengthen your relationships. In addition, you can hike for some cardiovascular benefits as well. Not to mention, visiting a national park can be quite budget-friendly. In fact, you don’t have to pay any entrance fees whatsoever. According to an article on Outdoorsy, there are several free entrance days such as August 25, September 30 and more. So, instead of worrying about flights and getting through security checks–why not visit a national park? If you need more convincing, continue reading. There are national parks all over the country. There might be one in your city. If not, you have over 400 registered national parks in the U.S. as an option. You can visit for a few days or a week. Plus, if you love camping, you can easily reserve a campground online. 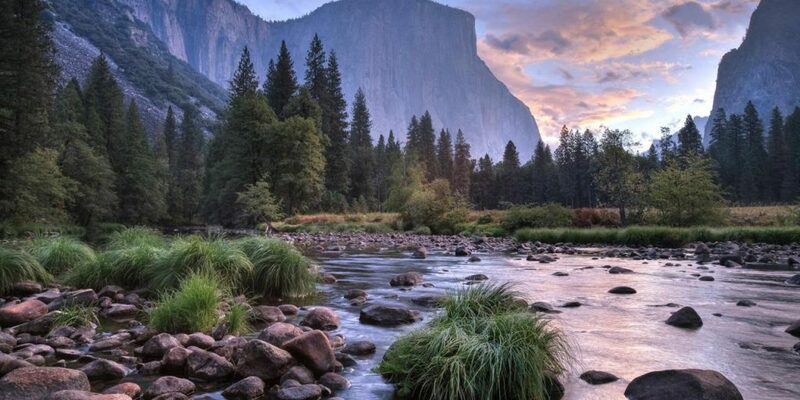 Trust us when we tell you that national parks will make you feel as if you’re in another world. When you consider the cost of airline tickets, hotel stays and cab rides–a national park day pass is pretty cost-effective. A day pass costs an average of $20. On the other hand, you can go on one of the free days listed above. And, if you’ve never gone camping, it is a must-try at least once in your life–even if you have to turn it into glamping. Renting a campsite can cost as little as $15. Sleeping under the stars and feeling the breeze against your skin is an experience that can’t be beat. Testing your survival skills, grilling food and telling stories is all part of the enjoyment. Plus, you can go fishing, play frisbee, roast marshmallows and more. It’s just fun to get away from it all for a bit. It shouldn’t take much convincing to sell you on the natural beauty of our national parks. They are some of the most coveted natural landmarks in the country. In fact, there are almost 2,500 national historic landmarks. This is untouched country, as it once was, as our ancestors saw it. Many trips consist of a lot of technology and sitting around in cars and planes. Visiting a national park is always a good time to take a break from electronics–call it a digital detox. Instead of texting, you can focus on your physical and mental health with activities such as biking, swimming, canoeing, walking and hiking. We hope you are now convinced to visit one of our many breathtaking national parks. It’s something you need to do on one of your vacations, especially with good family and friends. Nothing can compare to enjoying natural scenery and trying something new. Plus, you’ll get to see glorious wildlife in their natural habitats.